Year of appearance: 13th century. Height: 817 meters. 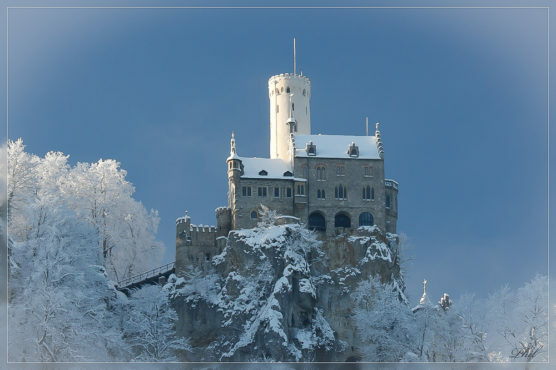 In Germany, among inaccessible and fascinating Bavarian Alps, you can find the amazing castle of Liechtenstein. It was placed on top of one of the steep rocky cliffs, the height of which is approximately 817 meters. Honau Mountain area, which hosts the castle is considered one of the most scenic in the country, is inaccessible cliffs alternated with incredibly beautiful forests. At first glance it is difficult to assume and how it is possible to climb to the top of the rock and enter the territory of an old castle. Guests of this unique sights you must first climb a mountain on a steep stone staircase, and then go on a suspension bridge, which was routed over the gorge. The first fortification on the site of the castle was built in the early 13th century, hundreds of years of existence of the castle is completely destroyed and twice rebuilt. In the early 19th century, after a recovery lock some time belonged to King Frederick I, who used it as his hunting lodge. The last owner of the castle was Duke Wilhelm Urach to him Liechtenstein owes its current impressive views. Under the leadership of the Duke of the last large-scale restructuring of the castle was carried out, today it is considered a perfect example of the architectural monument in the Romanesque style. In the old castle a lot of interesting secrets, so the room of the lower level were carved into the rock, to visit them will be interesting to all fans of unusual excursions. On the grounds of the castle offers a great view of the mountains, many experienced travelers prefer to visit this place in the fall or spring.